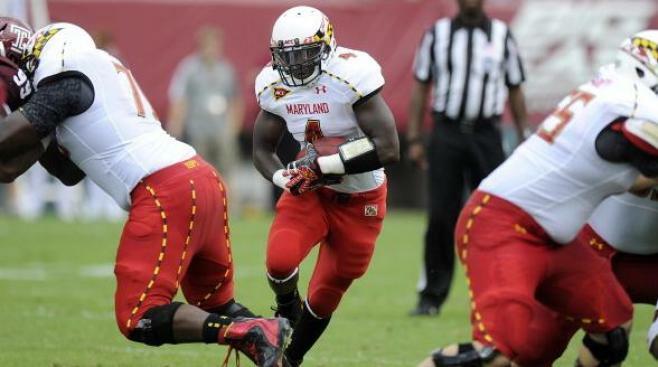 Maryland running back Wes Brown is a "person of interest'' in a non-fatal shooting in Baltimore and was arrested this week after allegedly assaulting a police officer who tried to question him about it, police said Friday. Brown was arrested in College Park on Wednesday after he assaulted a Baltimore officer who attempted to interview him, tried to flee and secretly recorded their conversation with a smartphone that he concealed in his pocket, said Sgt. Aaron Davis, a University of Maryland police spokesman. Det. Jeremy Silbert, a Baltimore police spokesman, said Brown is a "person of interest'' in the non-fatal shooting that occurred in the city last month. He did not immediately have other details about that case. The athletics department said in a statement that it was "extremely concerned'' about Brown's arrest. The university has suspended Brown and he is not allowed to participate in any football-related activities. "This is a matter that we take very seriously. We have been in contact with the local authorities and will continue to cooperate throughout the entire process,'' the statement said. Online court records don't list a lawyer for Brown, who faces charges of second-degree assault, theft of less than $1,000 and illegal wiretapping. The investigation into the shooting is ongoing. Brown was the Terrapins' second-leading rusher as a freshman last season, finishing with 382 yards on 90 carries and two rushing touchdowns. Brown was released on a $2,500 bond, and a preliminary hearing is scheduled for July 31 in Prince George's County.